Day 2 of the Annual Research Conference carried on with the same enthusiasm and vigour of the previous day. The first speaker of the day was Dr. Swati Shirwadkar, Professor and HOD, Department of Sociology, University of Pune. She spoke on the topic, “Ethics in Education towards the future of society”. Dr. Shirwadkar said that in an era of globalization and the world pushing boundaries at a fast pace, education and ethics play an important role in guiding the world in the right direction. Day 1 of the Annual Research Conference in SIMS, SIMSARC 2013, saw eminent and renowned personalities grace the occasion. The Chief Guest for the day was Dr. Ann Murphy, Dean, Metropolitan State Univ. of Denver, USA and the Guest of Honour was Mr. Filip Vandenberghe, Managing Director, Atlas Copco. The auspicious occasion commenced with lightening of the lamp by Dr. Murphy, Mr. Vandenberghe, Brig Rajiv Diwekar, Director, SIMS and Mr. Londhe, Deputy Director SIMS. This was followed by an address by both, Dr. Murphy and Mr. Vandenberghe. Dr. Murphy spoke about international accreditation, why seek accreditation and what does an accreditation process look like. She gave wonderful insights into the entire process, its pros and cons and how it is helpful. Mr. Vandenberghe addressed issues related to societal imbalances and expectations. He said that businesses need to be more proactive inorder to fulfil societal expectations and have to play a dominant role to minimize them to the best extent possible. In Mr. Vandenberghe’s view, this can only be done by optimally utilizing available resources and encouraging innovation in all spheres. SIMS aims at a holistic development of its student managers and for that reason, the Research Conference, organized by the Research Cell, commenced on the 11 December, 2013. The aim of the conference is to acquaint the student managers with the beautiful and mysterious realm of the research world and what it takes to push boundaries and search for the unknown. 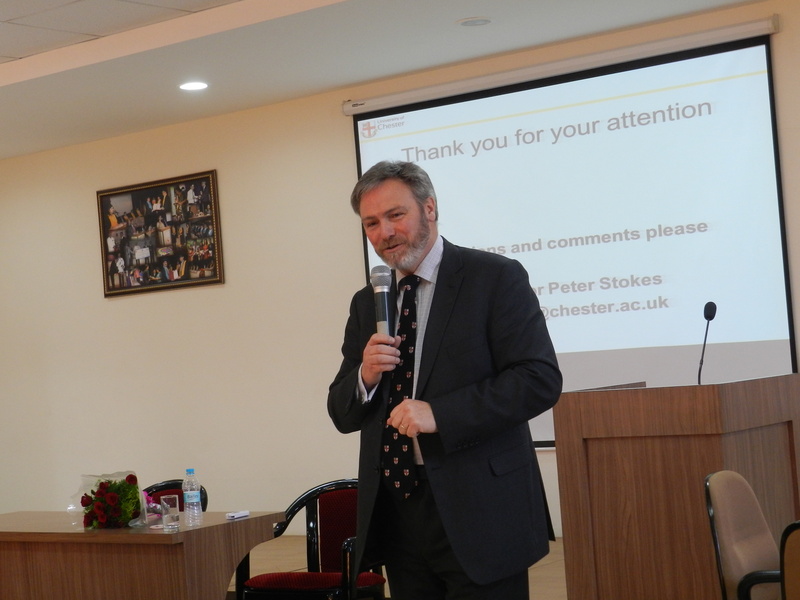 The speakers for Pre-Event workshop of the conference included Dr. Peter Stokes, Deputy Dean of the Faculty of Business, Enterprise & Lifelong Learning, University of Chester – UK. Dr. Stokes spoke about how essential it is to present the contents of a research in a manner that is self explanatory, factual and well articulated.